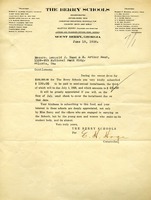 Letter to Leopold J. Haas and E. Arthur Haas from E. H. Hoge informing them that during the last drive for $100,000 they pledged $100 and Mr. Hoge informs them that their installment is due at the first of July of 1926. They thank them for their interest in the school. 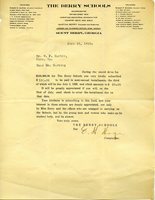 Elizabeth E. Evans sends another installment towards building the Berry Schools and says that she hopes the funds have been forthcoming. 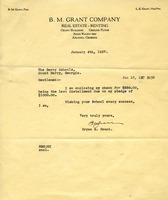 She explains that she dated the letter so that Miss Berry can access the cash as soon as possible. Mr. Haas sends his third installment check for the Berry Schools. G.H. 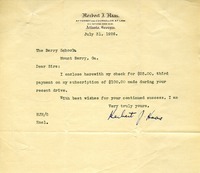 Hoge asks that Dr. Harbin send his semi-annual contribution of twenty-five dollars, that he promised to the school&nbsp;during the recent contribution drive.